Scotmid's Health and Safety team accept the award. "To have been awarded the Silver RoSPA Occupational Safety award on our first attempt was a dream result. We knew we were working in the right direction, and this award proves it." Scotmid Co-operative has won a prestigious national award in recognition of its excellence in promoting health and safety in the workplace. 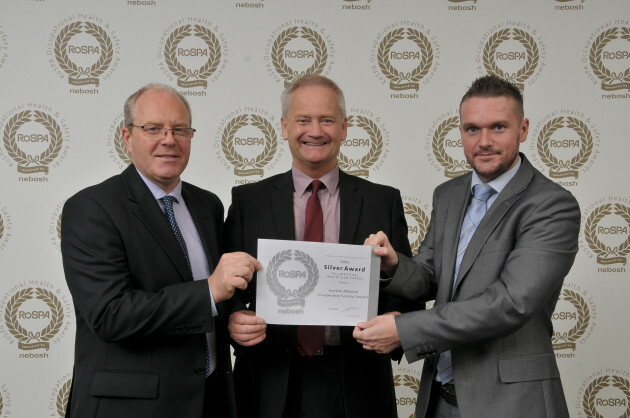 The retailer received a Silver Award at the RoSPA Occupational Health and Safety Awards on 17 September 2014 in Glasgow. The RoSPA awards, which are open to businesses and organisations from across the UK and overseas, are an annual scheme run by the Royal Society for the Prevention of Accidents (RoSPA). The judges considered entrants’ overarching occupational health and safety management systems, including practices such as leadership and workforce involvement. Scotmid’s Health and Safety team was praised for its modern approach to health and safety, excellent training programme and strong health and safety culture. Over the past year, Scotmid has transformed its health and safety management system to a sophisticated and efficient online dashboard, which allows staff to see data in real time. The team also hold regular awareness-raising events for staff and visit all 350 stores each year to conduct training and benchmark performance.